A innovative food and lifestyle program that focuses on all aspects of your heatlh. With our 2 consult package; and complete the comprehensive intake form which in itself has been described as 'enlightening' and 'challenging' to start on an transformative, full spectrum path to healing. 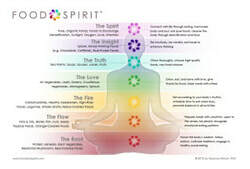 The Seven Aspects of Health are focused on restoring balance and health to each of the bodies major systems. Using ancient teachings and supported by current scientific knowledge Food & Spirit TM encompasses great eating, movement and mindfulness. By using the tools of the daily life log and the wholeself questionnaire this program is for anyone wanting to explore their health in a full-spectrum and integrated way. Explore diet, movement and exercise, relationships, emotions, empathy, creativity and more! The program utilises food as medicine, personalised meal ideas, guided meditations, flower essence therapy, journaling and mindfulness. Book the first 2 appointments today for an introductory $159 and start the exploration of the 1st aspect of health.